ITEXPO, MIAMI BEACH – The rapt, nearly all-male audience facing the front of the room here at the Miami Beach Convention Center could have been mistaken for a snap shot at a downtown bar last night, as millions of eyes turned toward HDTVs during a thrilling Super Bowl XLIII. But this was nothing so pedestrian as couch potatoes and Steelers-Cardinals: This was telecommunications professionals and Session Initiation Protocol. “SIP,” as it’s known, is a technology that’s drawing a football fanatic-like interest in the telecom industry – witness the packed conference room during a session hosted here at the Internet Telephony Conference & Expo by Stockholm-based Ingate Systems, a company that develops firewall technology and products that enable SIP communications for the enterprise while maintaining control and security at the network edge. Generally speaking, SIP trunking is a service offered by Internet telephony service providers so that businesses can adopt VoIP using their Internet connection. 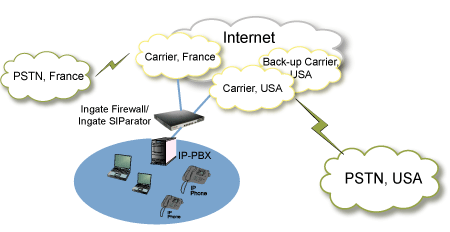 That way, they can communicate with others who rely on the PSTN, since the enterprise IP-PBX is connected to the service provider’s PSTN gateways over the Internet. Moments before the Ingate-hosted session got underway – a discussion titled “The Service Provider Perspective” that featured Todd Stires of AireSpring, Joel Maloff of BandTel, Sean Rivers of Bandwidth.com and Greg Rothman of Cbeyond – TMCnet talked to Ingate’s chief executive officer, Anders Eriksson, about SIP trunking’s popularity. For Eriksson, that means it’s not only the so-called “ITSPs,” or Internet telephony service providers, who are moving toward the technology. During the 2-hour session, Maloff discussed different ways that SIP trunking is provided – when it’s provided through a dedicated line, as a feature (for example, with hosted IP-PBX providers), or as a pure SIP trunking provider’s service (such as Bandtel’s). SIP trunking seminars and sessions are running through the entire ITEXPO event, which continues through Wednesday, Feb. 4. As TMCnet reported, one company that took advantage recently of Ingate’s SIP trunking is an organization that arranges dental care for underserved U.S. children. Pursuing their telecommunications upgrade to VoIP, officials at Kool Smiles replaced their traditional telephony system with SIP trunking from Ingate and saved 40 percent in communications costs. The Ingate solution, with new IP-PBX, phones and network upgrades, is expected to pay for itself with a year. Eriksson told TMCnet during our interview that he’s heard dozens of similar stories already from clients at ITEXPO. “We’ve heard this morning of savings from 25 to 75 percent, and have one reference case where a customer actually paid for its investment, the whole IP telephony switch, including gear, in less than a year,” he said. Don’t forget to check out TMCnet’s White Paper Library, which provides a selection of in-depth information on relevant topics affecting the IP Communications industry. The library offers white papers, case studies and other documents which are free to registered users. Michael Dinan is a contributing editor for TMCnet, covering news in the IP communications, call center and customer relationship management industries. To read more of Michael's articles, please visit his columnist page.